The Chandra X-ray Observatory spotted signs of a black hole among the remnants of a rare supernova. A team of scientists has spotted data from the Chandra X-ray Observatory that suggests a highly distorted, irregular supernova remnant may have, at its heart, the Milky Way galaxy's youngest black hole. 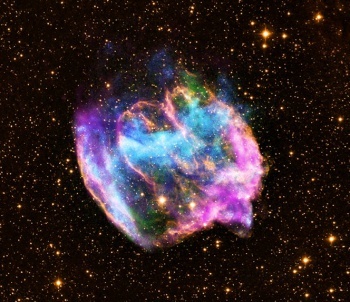 The remnant - which is named W49B - is about a thousand years old as seen from Earth, and appears to have exploded not all at once, but by ejecting matter along the poles of the star. When a star runs out of fuel and collapses, it usually explodes symmetrically outwards. "W49B is the first of its kind to be discovered in the galaxy. It appears its parent star ended its life in a way that most others don't," said Laura Lopez, who led the study at the Massachusetts Institute of Technology. Once a star has exploded it leaves behind a dense and compact object, usually a neutron star. In this case, however, the Chandra data shows no evidence of a neutron star, which could mean that a black hole has formed. "It's a bit circumstantial, but we have intriguing evidence the W49B supernova also created a black hole," said study co-author Daniel Castro. "If that is the case, we have a rare opportunity to study a supernova responsible for creating a young black hole." That black hole would be the youngest one known in the Milky Way galaxy. Studying extreme cases of supernova explosion is useful for astronomers, because supernovae are still not well understood. Because W49B is relatively close to earth at 26,000 light years, it's a unique opportunity to study an event that may lead to some new insights on not only black holes, but also into how regular supernovae occur. Because of the jets of material from the star's pole, scientists are comparing W49B to gamma-ray bursts, an event only observed in distant galaxies that scientists believe is linked to black hole formation. Scientists were able to understand how the supernova happened because of the distribution of elements in, and the shape of, the supernova remnant. For example, scientists found iron in only half the remnant, while other elements were more evenly distributed - marking the explosion as asymmetric. The study will appear in the Astrophysical Journal. Chandra space telescope is managed out of NASA Marshall Space Flight Center in Huntsville, Alabama. The Smithsonian Observatory in Cambridge, Mass controls Chandra's science and flight operations.